Welcome to the Grand Opening blog hop for Sparkle Creations Rubber Stamps! To start at the beginning of the blog hop, please go to the Sparkle Creations Rubber Stamps. Today we're releasing 8 new stamps! And we're giving away a ton of prizes! One lucky person will win the grand prize of all 8 images. There are also 5 single stamp prizes hidden, so make sure you comment on everyone's blogs! You will have until midnight Eastern time to comment and the winners will be announced on the Sparkle Creations Rubber Stamps blog. Now a bit about myself. I am the illustrator of the company. Sparkle has chosen me to design and illustrate characters and images for her new online Rubber Stamp Store. We met (online) in February and now we can finally launch the online store! Our normal procedure for illustrating these stamps involves about 1-3 stages of drafts and once a draft is approved by Sparkle I move onto inking! 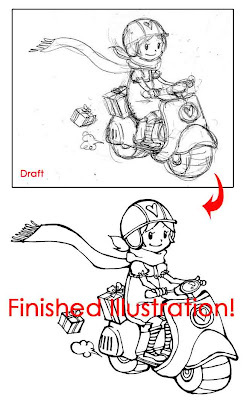 Check out how Scooter Chloe's image was created! I send the finished image to Sparkle in high resolution and she turns them into rubber stamps! We both have says in naming the characters. "Chloe" was chosen by me! Below is my finished version of Chloe! It has been lovely working for Sparkle. She has introduced me into this online world of scrapbooking/crafting and stamping! I hope you will purchase the stamps, create beautiful designs with them and inspire people around you! That way hopefully I will get to keep illustrating for Sparkle! Sparkle will be offering free standard shipping for all orders over $25 for the weekend (til midnight EST Sunday), and the code is FREESHIP. Thank you for stopping by and now it's time to go to Sandra MacLean's blog! I love all of your designs, they are just the cutest! Wow! you are super talented, love the Chloe image! You are one very talented artist and I am glad Sparkle found you. I am loving all of your designs. Welcome to the world of stamps and paper crafting. Your illustrations are great! Looking forward to seeing all the new images!..and more in the future! Chloe is so cute on her motor scooter!! Definitely adding this one to my wish list!! WOW!! No wonder Sparkle asked you to illustrate for her, you're amazing!!! Love how you created Chloe and the rest of the stamps. This is just adorable! I love the leaves! Your illustrations are fab! Can't wait to see more! Thanks for sharing! What talent !Love the skooter .... and so looking forward to using these cute stamps ! Your illustrations are incredible! I hope to see more stamps in the future! 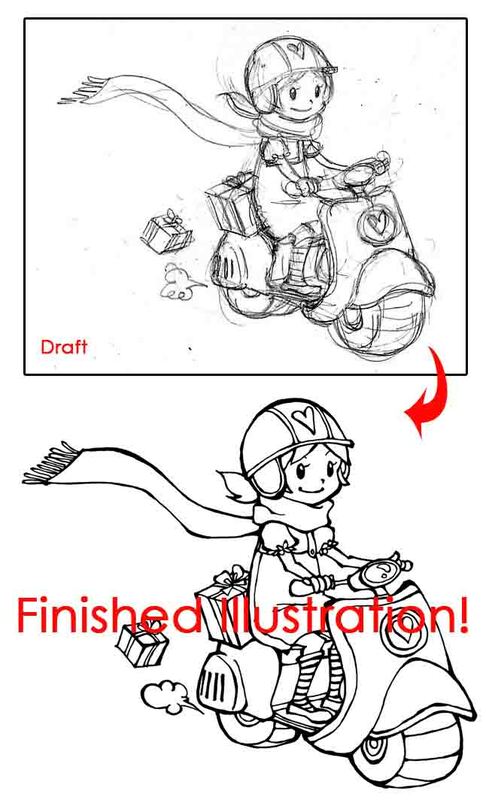 Aki, it is really amazing to see your original drawings and then your art. Great job and happy you paired with Sparkle to bring these images to us! ALWAYA BEEN A BIG FAN! read all your books too! I love the name Chloe! What a fun card! Your images are just too cute!! Such wonderful and whimsy illustrations you have Aki!!! I'm glad that Sparkle found you and youre now also creating images for rubber stamps! Loving your cute and whimsical style. So very Sparkle ;) It's always fun to see what the artist does with the image, I love the added details and patterns in your finished colored version of Chloe! Your are so talented, love your images/designs, they are so fun and whimical. oooh! Love this! 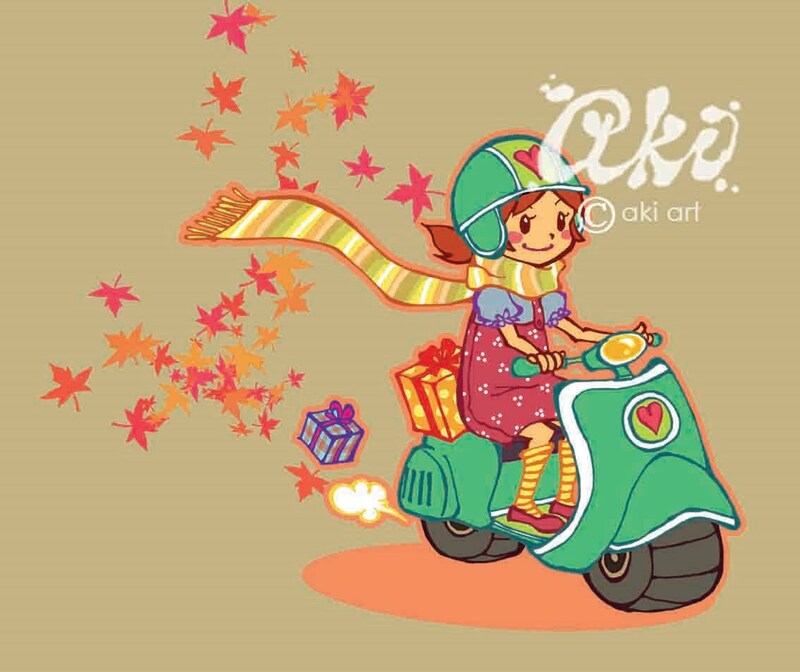 I really like the leaves flying behind the scooter! great job! Fantastic. and I love the hop and seeing all the ideas too. Thanks for a chance to win some! Gorgeous design! I love it!! Such a great artist! A fabulous design for sure, what wonderful stamps. Thanks for such a great grand opening. Your designs are just wonderful, thanks for the information on the process of how the stamps are created! Looking forward to seeing many more of your images in upcoming releases! Good luck to you! Your designs are very uplifting. Thanks for sharing about the process - thoroughly interesting. Love this image & all the best with your venture - these designs are so fresh & delightfully different - can't quite put my finger on it but they're thoroughly versatile. Thank you so much for sharing the "magic" that is so amazing. I can color like nobody's biz... drawing not not so much! So its awesome to see the begin the scenes to the beginning to a wonderful adventure. Aki, it is nice to have a peek into the creative process that goes behind the creation of the stamps. Wishing you and Sparkle every success with this venture! You are an amazing artist! I love these new stamps you've created for Sparkle! So sweet, Aki! Love Chloe!! Wow - what talent!!! Great card! I'm not surprised Sparkle chose you - it's like you were made for each other! Fantastic talent and looking forward to buying them when they get to the UK! Love the leaves and the colours....WOW! The company is so lucky to find you! Your design is so fun and fabulous! Your drawings are awesome. I'm going to show my daughter. She loves to draw. Aki your work is absolutely amazing! You are a wonderful artist hun!!! Gorgeous images you have made!!! Thanks for sharing the fun creation process with us! Happy Blog Hop Day! Love your work - these images are so much fun!!! Your art work is amazing, Aki! Glad that you met each other with Sparkle! Your images are so darling! Love them! I have just stumbled upon this site/store and am so happy I did! I love love love the images! you are very talanted indeed. Can't wait to see more and defintely can't wait to create with these images. Wow girlie...you are super talented! Glad you guys hooked up together! Love your images! congrats on the new company - you are very talented! I just got a scooter for my 40th bday, and this stamp is "Me"!!! You did such an amazing job on these. Love them. Your talent is amazing and perfect for Sparkle's style. I'm loving all of your designs. Too cute. You are very talented. Can't wait to see what the future holds. Chloe is so cute! Definitely one of my faves! Oh how cool! Your images are awesome! You're so talented Aki - love your style!! i absolutely adore what you've done with chloe...sooooooooo SWEET! Love your art! You have been blessed with some amazing talent. They are so cute and fun! Love the scooter and how fun this card is! Just too too darling. Love your talent! You are so talented!! Love them all!!! Wonderful drawing and will make great stamps!! Love all of them!! Thanks so much for showing us how it is all created. WOUZER!!! U are one VERY talented young lady!! Love loveee loveee all of your designs!